Hanoi (VNA) – Prime Minister Nguyen Xuan Phuc called on Vietnam and Thailand to redouble their efforts in order to bring bilateral trade to 20 billion USD in 2020. At a reception for Thai Deputy Prime Minister Thanasak Patimaprakorn in Hanoi on June 16, the Vietnamese Government leader suggested the two countries, as the world’s biggest rice exporters, partner with each other to keep rice prices beneficial to their farmers. A boost should be given to collaboration in trade and investment, he said, citing opportunities awaiting Thai investors after Vietnam engages in many new-generation free trade agreements. Besides, Vietnam boasts abundant and skillful labour resources that can meet Thailand’s demands, he added. The leader also proposed the two countries join hands in culture, national defence and security while strengthening bilateral ties in people-to-people diplomacy. Praising the affiliation between Vietnam and Thailand in regional and international forums, PM Nguyen Xuan Phuc urged the two countries to team up with other effected nations and international organisations, in the management, and sustainable and effective use of Mekong River water resources. More joint efforts should be focused on the actualisation of an action programme to realise the strategic partnership for 2014-2018 as well as agreements reached at Vietnam-Thailand joint Cabinet Retreats, the host said. For his part, the Thai Deputy PM voiced his wish that the Vietnamese Government will create more optimal conditions for Thai businesses in the country. The Thai Government encourages local investors to run long-term and sustainable operation in Vietnam, he said. The guest conveyed Thai PM Prayuth Chan-ocha’s invitation to PM Nguyen Xuan Phuc to pay a visit to Thailand in a bid to consolidate bilateral ties and partake in a number of activities making the 40 th anniversary of diplomatic ties between the two countries (August 6, 1976). 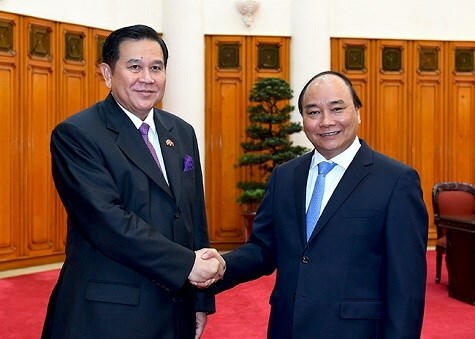 Also on June 16, the Thai Deputy PM met with his counterpart Vu Duc Dam, during which they shared the view that Vietnam and Thailand hold substantial potential for cooperation in economy, trade and investment that can bring bilateral trade to 20 billion USD. They agreed on the need for the two countries to reach a plan on tourism cooperation for 2016-2018 soon and foster their partnership in education. Host and guest consented to continue cooperating with other ASEAN member countries in order to maintain the intra-bloc solidarity and carry forward the ten-member group’s central role and common voice on regional and international issues. The same day, Thanasak Patimaprakorn was welcomed by National Assembly Vice Chairman Do Ba Ty, who thanked the Thai Government and people for their 100,000 USD aid package donated to Vietnam’s southern provinces stricken by drought and saltwater intrusion. Ty said he wished that the two countries will maintain the exchange of delegations at all levels, effectively implement their cooperation mechanisms and agreements, pay more heed to the role played by each country’s legislative body and step up cooperation between their parliamentarians. The Thai Deputy PM pledged to make all-out efforts in order to consolidate and strengthen collaboration between the two countries across all fields.